David Balfe (second right) of T Balfe Construction is picytured with Panthers trio Ged Rathbone (promoter), Trevor Swales (co-promoter) and Dale Allitt (joint team boss). Panthers promoter Ged Rathbone hopes a major sponsorship boost from a construction firm will help him build success. The city club have struck a five-figure deal with Lincolnshire-based T Balfe Construction to be their title backers for the 2016 campaign in the Premier League. 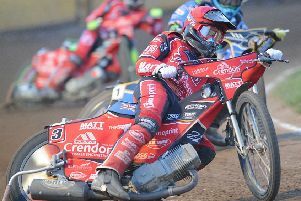 Rathbone said: “A sponsorship deal of this significance is a huge boost on the eve of what we hope will be another good season. “The way the company do things is very much in line with our own approach – it’s about ambition and honesty. “It only took a matter of minutes to thrash out a deal after we were first introduced. Rathbone thrashed out the deal with T Balfe construction director David Balfe, who also owns a car-racing team. He is owner of Balfe Motorsport which runs a Ferrari 458 in the GT International Open Series with son, Shaun, behind the wheel. And, after enjoying plenty of success on four wheels, he is expected plenty of thrills of the two-wheeled variety courtesy of Panthers. Balfe said: ““It is great to be able to support Panthers and hopefully we can help them onto bigger and better things. “The club has one hell of a set-up and they are also a very very friendly and very ambitious bunch. “I was made aware they might be looking for sponsorship so I thought I would come down to see Ged and his management team to see what they’re about. “They made me feel hugely welcome and I felt comfortable in their company straight away. “It is nice to be able to do a deal that should help the club while also giving us a way of marketing the fact we want to move into Peterborough business-wise.